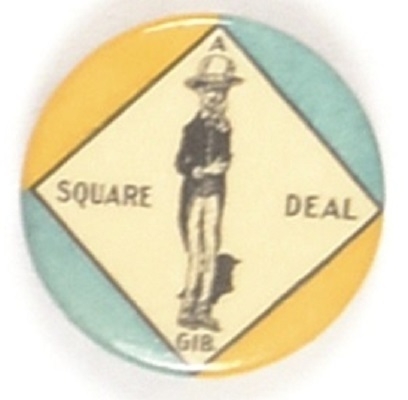 Theodore Roosevelt promised a square deal and so do this unusual 1 1/4 inch celluloid. This pin is associated with TR and that slogan and appears to be from 1904 with a Whitehead and Hoag back paper. It pictures a thin man holding one hand on his stomach and one hand on his chin. The letters “GIB” appear at bottom and we have to admit we don’t know what they stand for. Excellent condition.